Loyal Jezebel readers/ most people will have seen the charming NRA video which stays really classy by going after Obama's children and calling the President an "elitist hypocrite." 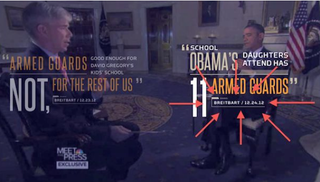 Well, they released another video (because they are real auters of le cinema) in which they call Obama a "HYPOCRITE" again, for saying, in an interview with David Gregory, that he was "skeptical" that having armed guards in schools was the "only solution," when "the school Obama's daughters attend has 11 armed guards." The only problem is the school, Sidwell Friends, has zero, not 11 armed guards. It has confirmed that their security officers do not carry guns. And while they have 11 people in their security department, as the Washington Post points out, "Five are listed as "special police officer," while two are listed as 'on call special police officer,' which presumably means they do not work full-time. The directory also lists two weekend shift supervisors, one security officer and the chief of security." So it's not like the school is crawling with security officers. Obama sends his kids to a school where armed guards are used as a matter of fact. If you dismiss this by saying, "Of course they have armed guards — they get Secret Service protection," then you've missed the larger point. He then makes the stellar argument, which the NRA echoed in its videos. Clearly, Breitbart.com has a major cinematic influence on the NRA. Speaking of cinematic influences, check out this parody video of the NRA's first video.